Kaustubh Khade sounds tired on the phone. Generally, even when he has had a long day at sea, he sounds excited when he is sharing his experiences. Not today. “It’s been a rather long day," says Khade over a patchy mobile network from Payyoli, a small town on the Malabar coast in Kerala’s Kozhikode district. It is a windy evening and you can hear the sound of waves hitting the shore in the background. “The line that I use to pull the kayak got stuck in the rudder and I was about a kilometre and a half into the sea…there was nothing that we could do. The vessel wouldn’t budge. So I had to jump out of the kayak, swim back towards it and unfasten the line." A strong wind and a turbulent sea only made matters worse. Khade, 29, is kayaking along the west coast from Kutch to Kanyakumari, a distance of more than 3,000km. Happenings like these are quite common, he says, but he tries to avoid jumping out of the vessel. “It is the last resort," he says. “Most often, I would try and fix the problems while sitting in the kayak; things like picking up the gear or paddle that falls in the water quite often." Before the incident with the rudder, he had faced headwinds for at least a couple of hours. “In Kerala, I get morning land breeze that is extremely strong and turns into headwind. The land ahead of me is south-south-east. So the wind coming from the east hits me in the face. So compared with, say, a week ago when I was paddling about 7.5-8km an hour, I am now doing only 5km per hour." With strong winds come big waves, which keep tossing the kayak around like a “rubber duck in a bathtub". In such cases, controlling the kayak becomes a task in itself. Also, the water keeps filling in from the back of the vessel. As a result, “the back half of my kayak is literally sinking in those conditions", says Khade. Through the expedition, which started from Gujarat’s Dwarka beach on 17 November and will end mid-February, Khade wants to create awareness about kayaking as a sport and raise funds for Magic Bus, a Mumbai-based non-profit that works for the empowerment of children and young people from marginalized communities. Partnering him in this expedition is his girlfriend Shanjali Shahi, an adventure sports enthusiast. While Khade sails along the coast, Shahi is covering almost the same route on a bicycle. By the time the expedition ends, however, Shahi, 28, will have covered a greater distance. While Khade kayaks for 30-45km a day, Shahi cycles 50-80km. “I have been kayaking for about eight years now. I have participated in and won medals at the International Asian Dragon Boat Championship in Thailand (2013) but what I realized after that is that very few people in India know about kayaking," says Khade. “I want to build kayaking in such a way that people here know it better." In March 2015, he completed what he calls the pilot—a solo kayaking expedition between Mumbai and Goa, a distance of 415km that he covered in 17 days. The plan is to cover the entire coastline eventually—the western coastline between Kutch and Kanyakumari is the first phase. “India has a massive coastline, 7,500km, which is one of the longest in the world. But Indians don’t go out exploring it," says Khade. “Shanjali, who has always been a traveller, also wanted to cycle through India, so when I came up with the idea, she joined me." “There is this popular thought that women don’t really get out travelling much. I wanted to change that," says Shahi. “Women are increasingly taking up solo trips, trekking and other adventures." Gurgle, clatter, whoosh. The tapered bow of the Epic 18X kayak cuts through water with ease. But what it gains in speed, it lacks in stability. Before the Mumbai-Goa sail, Khade had to take lessons in how to turn the kayak 180 degrees up from a sitting position—in case it capsized. These rolls are fundamental to whitewater or river kayaking, where the paddler is sitting strapped inside the vessel. For Khade, however, who was a race kayaker and used sit-on-top, surf-ski kind of vessels, it was a hard lesson to learn. It took him almost three days to master the roll before the expedition, where he used a sit-in kayak for the first time. The Epic 18X is an 18ft-long carbon-fibre, sit-in kayak. And at 19kg, it is deceptively light. Shahi rides a Schwinn bicycle. For the trip, the couple is accompanied by their driver, Nitin Kotawadekar, in a car. The travel gear includes ropes, a couple of DSLR cameras and GoPros. Khade keeps a couple of dry bags to store his stuff in the kayak. It also contains about 6 litres of water and a bunch of energy bars. Shanjali Shahi on the road. 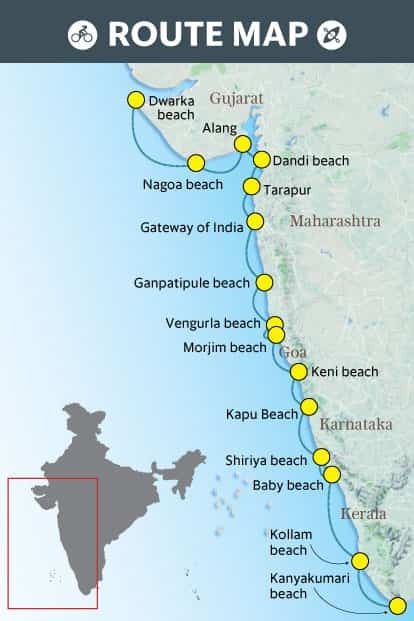 Along the way, they have travelled through Dandi and Alang in Gujarat, Nagoa in Diu, the Gateway of India and Ganpatipule in Maharashtra, the Baga beach in Goa, Murudeshwara in Karnataka, and Kannur in Kerala, and will cross Kochi, Varkala and Kovalam before they reach Kanyakumari. One of the most important things about such an expedition is coordination. “The two of us have to coordinate to locate each other. We have different routes and different speeds and at the end of the day have to track each other down," says Khade. “So we have phones that have Google maps and some other apps that help us trace the other one’s location." Khade and Shahi, both Mumbaikars, left their corporate jobs in early 2016 to plan and train for the expedition. “It’s actually pretty hectic, the entire planning part," says Khade. An expedition of this magnitude is new to India and it took a long time to get the authorities to understand the what, why and how of the project and then secure the permissions to sail along the coastline. Equally difficult was to find the right sponsor for the expedition. Khade says it took them around six months to get the permissions and find a sponsor in SF watches. And even with all the papers in order, they have been stopped at several places. “When I entered Kerala, a fishing boat came right next to me. The person at the motor took out a bunch of rope and threw it around my kayak. Luckily, I slowed in time, so the rope missed the kayak. I learnt that he wanted to tie my kayak and take me to the court there for inspection. They didn’t know who I was and what my business was there, so that’s why…"
Smugglers have left people in northern Kerala especially vigilant, says Khade. And the fishermen work closely with the police. “This particular fisherman had called the police station and it took me a while to make them understand my job there," Khade says. “But they asked me to visit the police station anyway." That evening, with the kayak stowed away over their car, the couple went to meet the police. “I told them about the expedition and though it wasn’t easy to make them understand something that they thought was crazy, the cops were nice enough to issue a stamped order for me so that these incidents don’t recur. The day ended with all of us taking group photographs." Proper diet and training was also a big part of the planning. “Both of us needed to build our stamina considerably before we could take up a project like this," says Khade. Contrary to popular belief, kayaking, Khade says, is not an upper-body sport. “You actually use every muscle starting from your calf to your back and upper shoulder and arms," he says. “The fundamental of long-distance kayaking is that you don’t kayak with your arms." Shahi started yoga to “figure out how to use my knees properly while I am cycling", she says. “I needed to focus on my back specifically so there were a lot of asanas, such as sarwangasana, halasana, that I did to stretch my back. I have been practising them and it has been useful." The couple went on a high-protein diet. “I used to have three eggs and muesli for breakfast, a lunch of 300g grilled chicken breast with some carbs, say, a piece of toast, an evening snack of five egg whites, followed by a dinner of another 200g of grilled chicken," says Khade. “We followed this diet for about three months." “I love the excitement of the unknown that the sea offers," Khade says. “I keep telling people that if they go to the same beach in the same waters for two days, the experience will be completely different and that is because the sea is constantly changing." It is the adrenalin, the sea spray in the face, the sparkle in the eyes, and the story waiting to be told that draws him. “There are some crazy stories from the sea. But I must say that fisherfolk are some of the nicest people I have met during the expedition," says Khade. “The fisherfolk work differently in different places. In some places they put out the nets in concentric circles and then they pull out. Certain others just trawl, so they have this line that they pull which has fishing nets very low in the water. Then there are yet other people who put in a straight line of nets and then the current does the job for them. And they pick the nets up as they go. People, in general, have been kind and generous, says the couple. “Even when we landed in small random fishing villages, people would see the boat and would invite us to their homes and share their food with us. We were complete strangers there, and they were like, ‘Come sit with us. We’ll cook some fish for you,’" says Shahi. Khade grew up in Powai, Mumbai, and sports has always been a part of his life. “I have played everything from volleyball to swimming to rugby," says Khade. He studied computer science at the Indian Institute of Technology, Delhi, from 2005-09 and then moved to Mumbai to work for a technology start-up. “Kayaking started in 2009-10," Khade says. “I went to Goa with a friend. We were at Palolem, where they rent out kayaks. We decided to do it and I fell in love with it. When I came back to Mumbai from that trip, I found this place in Marine Drive where I trained." He met Shahi at work in Mumbai about three years ago. They went for rafting once and have been together since. Shahi was born in Bihar but her parents moved to Mumbai around 2005. She studied journalism at the Amity University in Noida, near Delhi, and business management from the Indian Institute for Finance and Management, Mumbai. She has walked the frozen Zanskar river as part of the Chadar trek in Leh, cycled from Mumbai to Goa and Manali to Leh, and climbed the 12,000ft Chanderkhani pass, among other things. “We quit our jobs (last year) because we wanted to do this expedition and thought that this might be the right time," says Khade. “The body might not hold it later after I turn 30." An expedition of this magnitude is always difficult. There are so many variables and at so many levels that a lot can go wrong along the way. The worst moment of the expedition so far was in Rajpara in Gujarat. “There were rocks in the sea up to 2-3km. The water was turbulent and brown. And it was strange because from Dwarka till Diu, the water was crystal clear," says Khade. “I was being tossed around like a rubber duck in a bathtub. It was the first time in the eight years of kayaking that I was afraid of falling in the water." Something similar happened just before they hit Mangaluru. “There was massive turbulence. There was strong wind from my right that brought waves so high that they were hitting me on my chest. Every time that happened, the kayak would turn at 90 degrees and I would come to a grinding halt." Solitude is another major force to encounter: The sea is immense and disorienting. The only sound that breaks the monotony of splashes and paddles is the occasional whistle from a distant ship. “That’s when the mind starts playing tricks and you start questioning everything," says Khade. “It all looks frivolous. I tell myself to drink some water because it could be a sign of dehydration as well." “At times, when I reach the beach before Kaustubh and can’t see him out in the sea for a long time, panic sets in," says Shahi. And then there is the matter of perpetual exhaustion. Fortunately for them, the expedition has been a good one from the safety point of view. “People have stopped us and asked questions. But mostly they have been very kind. Apart from constantly struggling to find a decent washroom along the route, there hasn’t been any bad experience so far," says Shahi. Usually, their day starts at about 5.30am. “We eat something, mostly some energy bars and a banana, some boiled eggs, if possible. Then we load up the kayak on top of the car, pack everything and head to the beach," says Shahi. “I drop off Kaustubh and then Nitin and I head off. In between, Nitin and I keep taking pictures as well." They pre-plan the routes and the meeting point at the end of the day. “I stop in between for a tea or two, or to see if I find something interesting. Make some videos. By the time I reach the meeting point, the day is almost over," she says. “I paddle from 8am to about 2-4pm," says Khade. “A lot of time then goes into finding proper accommodation where we can keep the kayak and the cycle safely. It is mostly very close to the beach. Dinner is generally light and we hit the bed by about 9-9.30pm." Khade says he has never kayaked in the night. “There is turbulence and then there are rocks. And I kayak about 4-5km into the sea and, if I can’t see the rocks, that’s not the place I would want to take a risk," he says. “It is funny. When you are out in the sea, you want some sense of normalcy and when you are on your desk in an office, you want some more adventure," he says. It is getting late in the evening. They have to eat dinner and retire for the day. The expedition resumes in less than 12 hours. Behind them, the waves are hitting the shores.